As both the Fish and the DomPost has noted, there seems to be a sudden flowering of late in the startup of apartments. We noted that a short while ago, and have been reporting on the start of Te Aro Towers and the Tattoo apartments. These, as you know, are both Archaus jobs – it seems that the market is starting at the “cheap” end of the range, which I woul dhave thought was unusual. 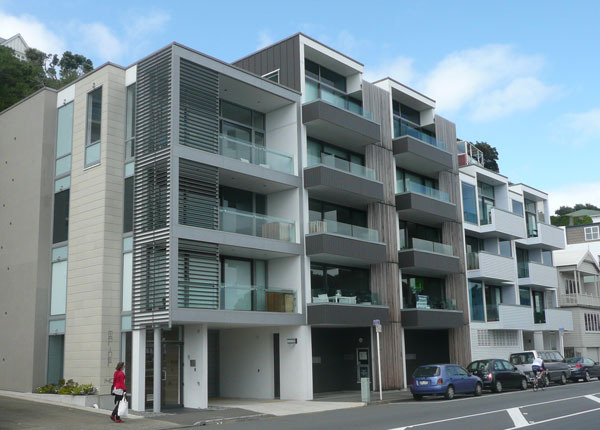 We’ve noted that the Tattoo apartments are 50m2 each, which is getting to be an almost acceptable size for a 1 bed apartment – and the DomPost is reporting that the long-stalled Il Casino Apartmento is selling places starting from the mid $400k mark, for a 54m2 apartment. That’s not large either – and that is supposedly from a good development. The bigger apartments, with bigger better views, are of course lots lots more. Even the long dead Watermark site appears to be possibly stirring from the dead, according to this report. But evidently, the flow of available readies has been turned back on again with a rush – liquidity must be flowing through the banking machinery once more. If only the banks could control their impulses to lend to much money, and avoid this tedious boom/bust cycle we ride upon. The other big apartment developer architects in town are of course the team at Architecture Plus. They have been prolific through the last year or two, with developments for Craig Stewart at Stratum. 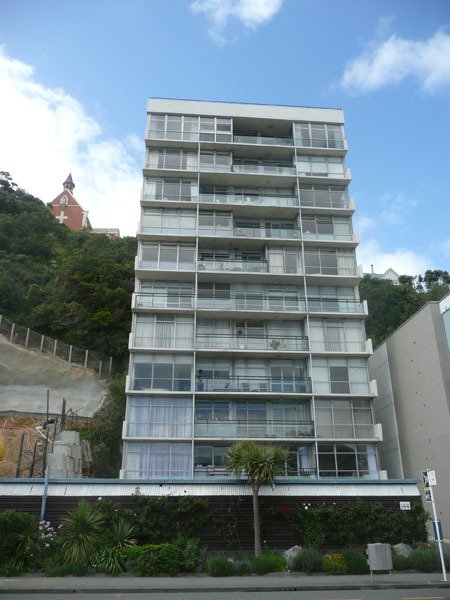 Some of them have been looking great from the outside, like the Monument; some merely interesting like the Piermont, others, like Marina and Dune and Blanc down by the Freyberg Pool, are OK, but not overly exciting. Even the Republic apartments are coming along – nearly, or actually finished. No idea what any of them are like inside, due to the lack of info on their websites. 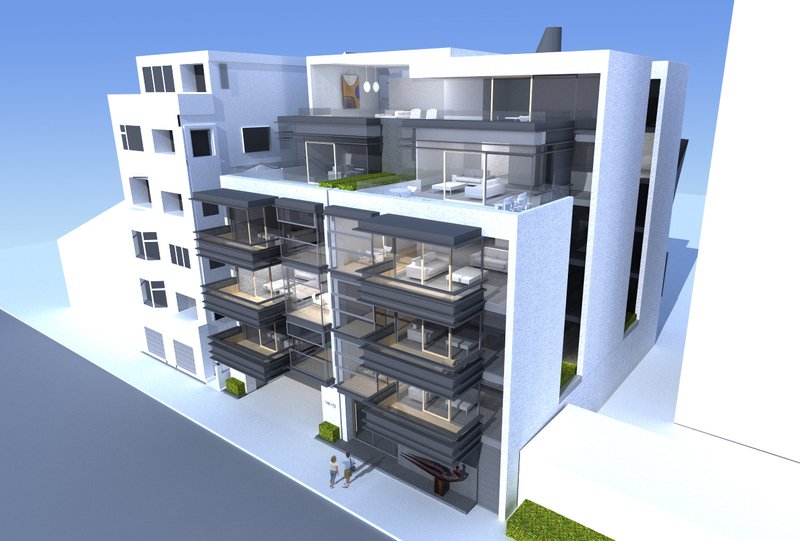 Stratum have nabbed another site down on Oriental Parade of late, with Arch Plus as architects again, and a similar looking design to the existing Blancs, shown above. We’re more than a little saddened to see the old Parade Cafe building go, even if it has been replaced by a Cafe in a tugboat. Yes, as a Fishy character, I’m excited that there is a better quality cafe in the boat than that previous restaurant in Tugland, but the whole culture of Oriental Bay relies not just on the beach, but on the life on shore as well. The life that comes from visitors who buy an icecream at the Ori Bay dairy, or eats dinner at Beach Blanket Babylon Boys Baby Bar (or whatever name it has), or from the odd fish who eats a slice of cake in the Parade Cafe after surviving a gruelling spell training for a triathalon. The window up the front (viewing not just the bay, but the peoples in the park) is irreplaceable, as is the sheltered courtyard out the back. No room for the general public of Wellington in this one. There are places in Wellington where retail and hospitality does not flourish at ground floor level, and where exemptions should be made. But there are also other places where existing users spell out a clearly flourishing need / requirement / desire for a roadside cafe and the site of the old Parade was clearly one. Our existing planners and consenters at the Council are clearly mad and missing the plot if they knowingly let Stratum delete the cafe and put in garaging at ground level instead. No matter how nice, looking at a Pual Dibble just doesn’t cut it by comparison. 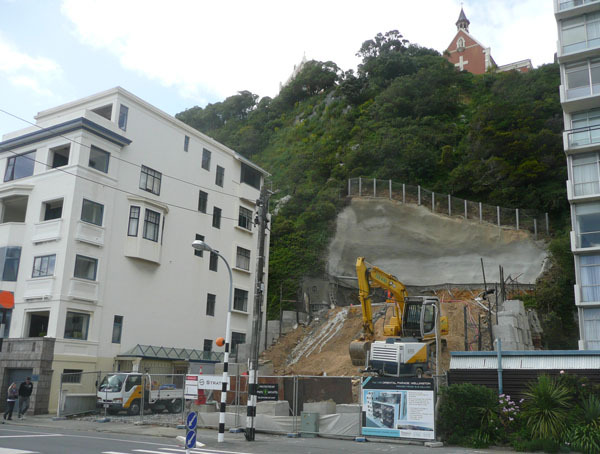 Still, having got off on a bad foot by destroying one of Wellington’s well loved cafe locations, and replacing it with – well, let’s see what, the developers and architects have got a long way to go to make amends. Thankfully, they’re being very cautious at nibbling away at the cliff up above – they’d be creating no friends at all if they let St Gerald’s monastery fall down the cliff. So, what they’re doing so far is to create a very big hole, and carefully stitch the hillside up with sprayed concrete and (we hope) lots of clever reinforcing. All we see so far is just: bare earth. More, we’re sure, to come. All we can do at present really is admire the neighbours – two buildings that were each leaders of their own time. On the left we have one of the oldest apartment buildings in Oriental Bay, which has stood the test of time incredibly well. Six stories high, with a lovely bay window out the side (sadly to be obscured by the new apartments), this building has always intrigued me. It has a stone front at the base, and open balconies facing into the sun: presumably tried and tested non-leaky balconies, of which the building profession no longer seem to be able to do (judging by the former Mayor’s apartment just a few doors away, currently covered in scaffold). I’ve been searching for info on this building, 154 Oriental Parade, as I know I have seen it written up somewhere before – but it is not coming to light from the googleplex today. It is not listed as heritage on either the HPT list or the WCC list, and yet it is, I believe, the oldest building on the street. I’d guess at about 1910-20 perhaps? On the other side is a tall 1960s block – the Dorchester, if I remember correctly, and at a guess this was one of those buildings that probably started off the whole height limit argument in Oriental Parade. This building is as different as it can be in every single way. It is aligned east west instead of north south; it opens up instead of closing in; it hugs the cliff, not the street edge; it is all about seeing and being seen, rather than retreating into the depths of solid masonry. Now, I don’t know about you, but I don’t really believe a word of that. How many times have you seen Bob Hoskins or Pete Postlethwaite talking their poodle for a walk along the Parade? And just how likely is it that Emily Watson lives here either? (note: Emily Watson the actress, not Emma Watson, the notoriously spunky young 19 year old Wizard. Come on, what would she be doing buying an apartment on Oriental?). Sam Neil – isn’t he living in Otago? Oriental Parade to me is the home of all the rich and boring / lucky people, who don’t need to work and can stay in all day and look out at the view. Lawyers, retired judges, ex-All Blacks, and a lot of old retired grannies, toasting their tootsies in the sun. Maybe they all live together in the same apartment, like an acting version of the Young Ones? I don’t believe it either. I wonder if a couple of them might have stayed in a rented place for a few months while they were working on a local production? That there’s fighting talk ! Let me counter your point there. The RMA allows a certain amount of things to be done with a site: permitted activities. Council, surely, cannot mandate that a building has to be mixed use, or has to have a cafe at ground floor. Its all very nice to say that the Council should / must insist on a Cafe at ground floor level, but think of the other side of the coin. Noise, smell and nuisance of cafe / restaurant customers. Parking issues. Restriction on what they can do with their own land. Cost of construction – what if the Cafe can’t afford the lease rental? What if they don’t want to continue with the lease? Just to let you know that (another) of the good things included in Plan Change 72 is encouraging ground floor non-residential activities in Oriental Bay where these support use of the public space. While any such application would be Discretionary Unrestricted the clear policy intent would guide planners to support appropriate applications. The OB Design Guide also supports that. 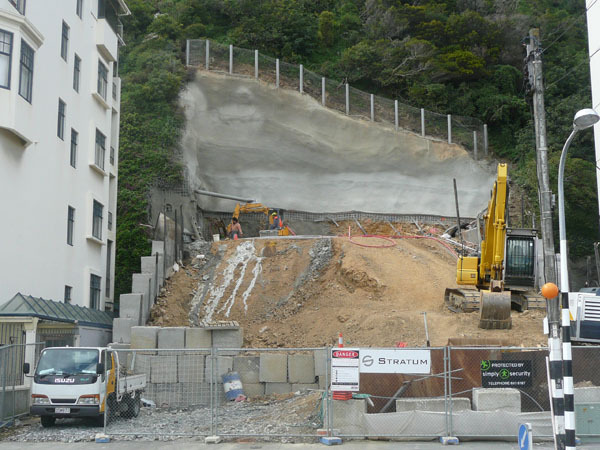 So – Council obviously can’t require developers to provide ground floor activity, but we can allow it, and I hope and expect that, especially as PC72 gets through the appeals process, we will at all levels be encouraging developers in Oriental Bay to think cafes, retail etc that supports the public use of Oriental Bay. To me that makes a whole lot more sense than a bunch of apartments with just garage doors at ground level. I have to leap in here, if only to dispel the assumption that everyone involved in the consenting process at the council thought this development was worthy of the official rubber stamp. Council planners seek expert advice from a number of internal sources when assessing a consent – things like traffic, wind, and urban design. Yes, consent was approved by the council’s planning team, but I suggest you request a look at the urban design advice that was provided as part of this process. 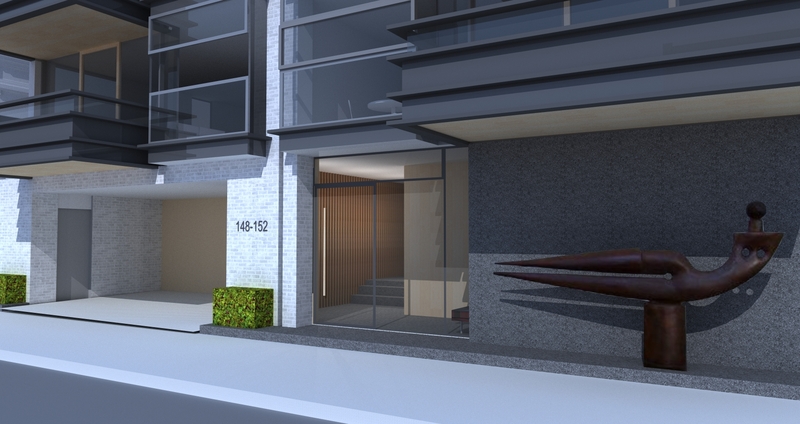 It’s public info, if you care to take the time, and you’ll find this development did not receive full urban design support due to exactly the points you raise above. Like your spelling/interpretation of Kerry Prendergast’s (ex-) job!